Newspapers are great for filling in the gaps in our family histories, uncovering information that would never be known using vital records alone. That has been the case with my research on my gg uncle Charles James Harman. 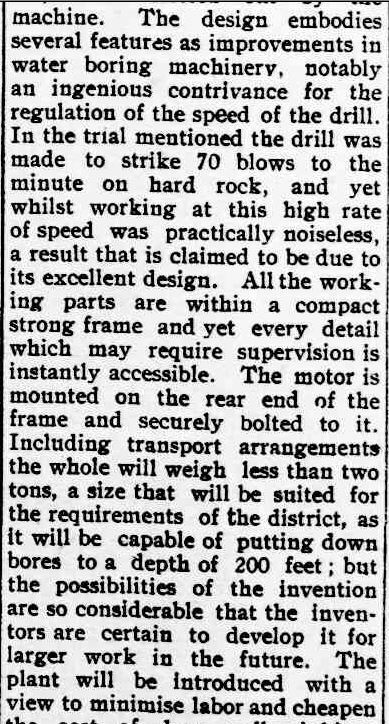 The co-subject of last week’s Trove Tuesday post, Charles just keeps popping up in the papers offering me more and more about him. I had found a lot of information on his post-war life in The Argus, but the arrival of the Hamilton Spectator and the Port Fairy Chronicle at Trove has helped me fill in his pre-war days, spent around Macarthur and Byaduk. Firstly, I discovered why Charles’ engineering skills were quickly noticed by the Australian Flying Corps (AFC), with his mechanical crew keeping the No.1 Squadron in the air over Egypt during WW1. Also, I found Charles had a friend. Yes, even our ancestors had friends and I’m always keen to find those relationships. 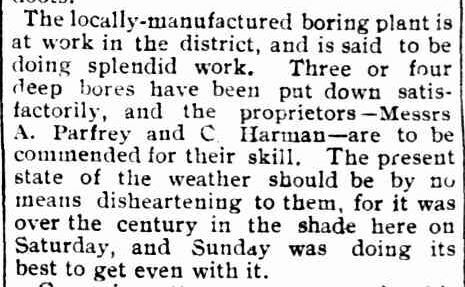 The following article from the Port Fairy Chronicle drew my attention to the working relationship between Charles and Arthur Parfrey, but the letter Charles wrote to Arthur, featured in last week’s Trove Tuesday, proved they were mates too. Macarthur Matters. 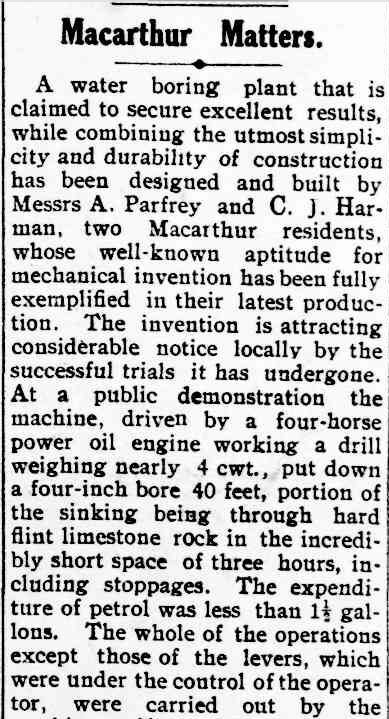 (1914, December 31). Port Fairy Gazette (Vic. : 1914 – 1918), p. 2 Edition: EVENING. Retrieved March 10, 2014, from http://nla.gov.au/nla.news-article91982808Twelve months before this article, Charles became a widower after his wife Catherine Kinghorn passed away. Catherine was ten years older than Charles and thirty-seven at the time of their marriage in 1905. They never had children. 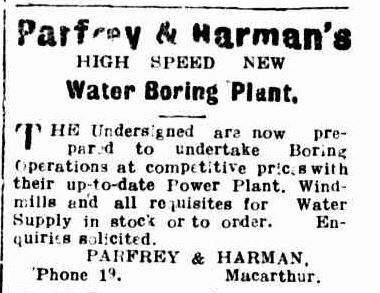 By January 1915, Charles and Arthur had their water boring plant up and running and available for hire. Business was brisk with dry conditions prevailing. But things can change so quickly and with the war escalating, drought and no family ties, Charles sold up everything in April 1915. On 12 July 1915 at the age of thirty-six, Charles enlisted, never to return to the Western District as a resident again. 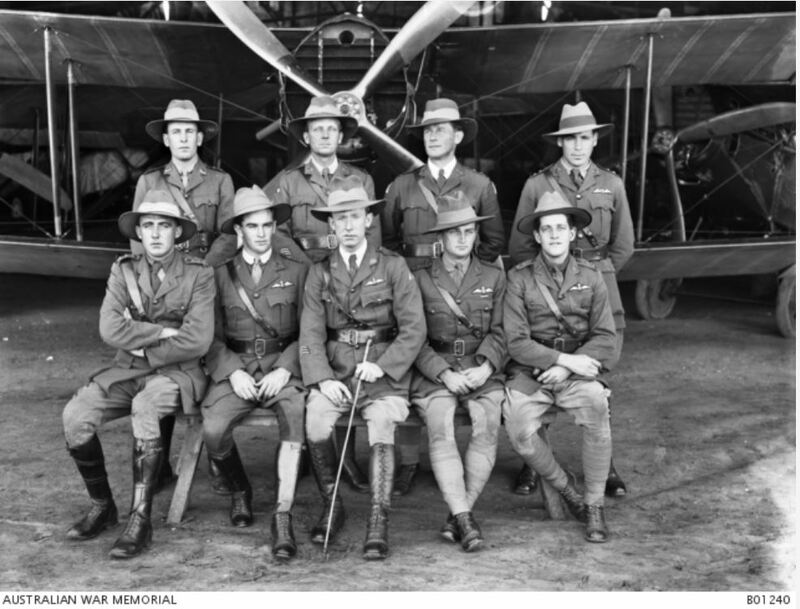 The rise of Charles through the ranks with the AFC, finishing the war as a 2nd Lieutenant with military honours, led to a posting in London during the 1920s with the Royal Australian Air Force (RAAF) followed by a life in Melbourne until his death in 1943. The last half of Charles’ life was a total contrast to the first half. He went from pigs and dairy cows on the farm at Macarthur to rubbing shoulders with the highest ranked officials in the Royal Air Force and RAAF, flying in airships and attending the funeral of the victims of the R101 airship crash at St Paul’s Cathedral, London. Other attendees included some of the highest ranked officials in England including the Prince of Wales. All found out thanks to online newspapers at Trove. 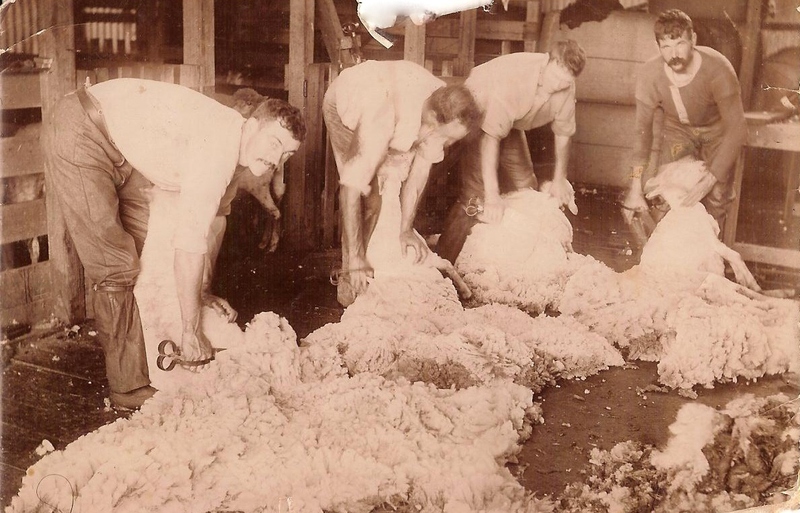 This entry was posted in Trove Tuesday and tagged Harman, Parfrey. Bookmark the permalink. This is a great story! Charles certainly had an interesting life. You’ve come up trumps with Trove! Thanks Frances. Charles is probably the most interesting of my relatives, particulary in the Harman family. I’ve been interested in his story since I first read his War Service Record but Trove told me things I never dreamed of finding. Trove is brilliant that way, isn’t it.